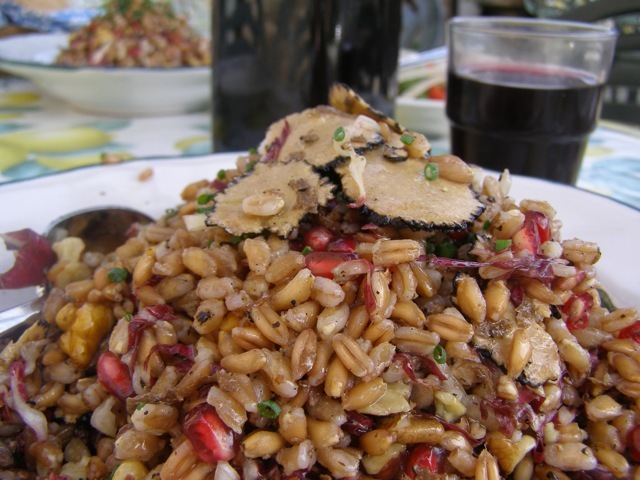 A lovely fall take on a farro salad using local walnuts, pomegranates & shaved truffles atop - making it a delicious & decadent side-dish for the holidays! Pomegranates are packed with antioxidants and delivers amazing health benefits, combined with the off the charts nutrients in farro and the protein packed walnuts - this isn't just a Superfood but a Supersalad! In plenty of cold water boil farro with your vegetable scraps until al dente (cooked but with a bite) - about 20-35 minutes. Drain the farro in a colander & remove vegetable scraps. Allow to cool for a few minutes. In a large seperate bowl combine the farro with radicchio, nuts & pomegranate seeds. Give it a good mix and season with salt & pepper. Drizzle over the salad a couple tablesspoons of vinegar followed by three times the amount of extra virigin olive oil. Do it in your minds eye, just remember the 3 to 1 ratio. You can always adjust later. Give it another good mix. To finish, give it a good shave of fresh truffles, if not available truffle salt or oil works well too. Top with a few pulls of a potato peeler across a wedge of parmesan. Allow to sit for at least 20 minutes up to a day - it needs a little time for it to all come together. Before serving - give it one last good stir, taste & adjust the seasoning - making sure the dressing is balanced (not too vinegary or oily). Serve as an antipasto or side dish. this recipes looks super healthy and delicious! I just recently had faro and really enjoyed it! I made this today although, because it's summer in Australia, we had no truffles. I remember adding truffle oil when we made it at the farm in October but I think in summer it's possibly nicer without. Delicious both ways.